I haven’t been working too much on the rug, but will have more time in the next few days. Learning lots about hooking text. Although I traced the font, I find the actual hooking is more like handwriting. Each letter, although related to its cohorts, is slightly different. And then there is the world of meaning behind the quotation. Time to think about that as I hook. The templates you see scattered there will form the design of the middle of the rug. Right now I am thinking they will be in a spiral–but that will develop as I hook the text at either end. Thank you for your support and have a great weekend, all of you. The weather here in southern Ontario is spectacular–even though there is that bittersweet touch of fall in the air. Your purses and little pouches ROCK, that’s why they fly off the shelf! I can’t wait to see what you’ll have for Christmas!!!! I hook also and love the lettering you have in this rug. I am looking for a cool font for a rug I am hooking. Looking for a script for the word “Giverny”. Do you have any suggestions of where to look other than “Word”? Wow! Thank you for the great comment, Sheri! 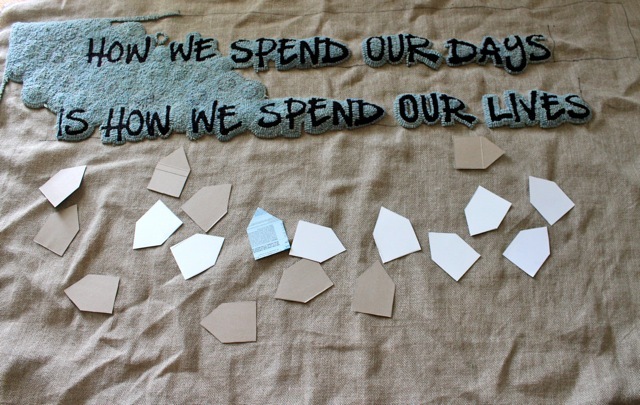 The site I used for the font on the How We Spend Our Days rug is http://www.dafont.com/. There are many many great fonts on that site and I am sure you will find one that suits Giverny. Thank you. I’ll check that site out soon! I too was doing some serious purse drooling, but seriously, I have to stop buying them. 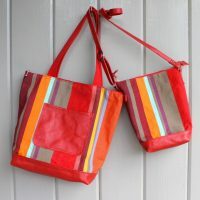 My red one is my fave and it goes virtually everywhere. I have been thinking about writing to you all summer. Every time I pick up the rug, I think of you and your contribution to the font. The background is an as-is texture. I am hoping to move the colour of the background gradually to a soft orange and yellow and rose and then back to blue. Not sure how this is going to go. And not at all sure about the design in the middle–but have lots of hooking to do yet at either end before. Btw, I got to Kaliyana in Montreal in the Old Port and as you predicted, I loved it and found great things.